Welcome to Swift! Here you play as a little spirit sent to save the heavens from chaos. Shoot down oncoming obstacles as they scroll in from the right. If you take down enemies fast enough, you earn bonus items that give you special powers. As you destroy more enemies, you ascend to higher levels and have the opportunity to get better weapons.Be careful to avoid oncoming obstacles. Both enemies and their bullets will hurt you. If you are hit, you will lose your weapon upgrades and health. Destroying enemies will recover your health and allow you start scoring and earning weapons once again. Use the touch screen to move the spirit around and shoot bullets. Tapping directly on the spirit makes it shoot bullets. Dragging the spirit around the screen allows for smooth, controlled movement. To dart away quickly, simply tap elsewhere on the screen and watch the spirit zoom to the new location. You start out shooting crystal bullets. As you earn scores from defeated enemies, the bar in the upper right corner of the screen gradually fills up. When it’s completely full, you gain a better weapon. The higher the scores you get, the faster the bar fills. If you get hit by an enemy or enemy bullets, you drop down to the previous weapon you had. You cannot score while injured, so you need to fully recover your health before the weapon bar will start to fill again. You can replenish your health by killing enemies. Crystal bullets are shot one at a time, and they have a rapid recharge rate. This is the basic starting weapon type. Enemies killed with crystal bullets result in scores multiplied by one. Aqua bullets are a spray of water that shoot three bullets at a time. 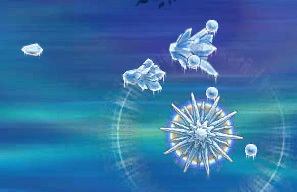 The recharge rate is slower than the crystal bullets, but you can hit multiple enemies at a time. If you kill an enemy with aqua bullets, the score you earn is multiplied by two. Mist bullets are clouds of gas that shoot six bullets at a time. They have a slower recharge rate, but can hit enemies in many directions at once. Victories resulting from mist bullets have their scores multiplied by three. As you make your way across the skies, you will encounter different kinds of enemies. As you defeat these obstacles, many good things can happen. Your health is replenished if you are weakened, you score with each victory, and you can earn better weapons. Defeating foes also increases the level bar at the bottom of the screen. When this bar is full, an extra powerful enemy is summoned, and you must destroy it before you can move forward to the next level. As you climb into higher levels, the enemies you face become stronger and faster. They take more hits before they are destroyed, and they can shoot more bullets. You can recognize these stronger enemies by their size: larger enemies are stronger than smaller ones. 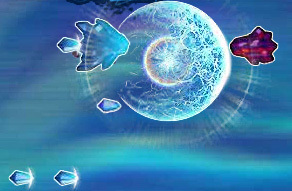 Crystal enemies travel in a straight line and shoot crystal bullets as they twirl through the sky. 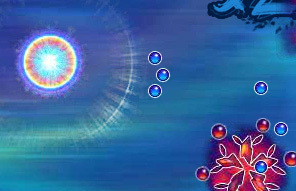 Aqua enemies are blobs of liquid that bob up and down as they wiggle across the screen. They shoot sprays of aqua bullets. Mist enemies zig zag all over the place as they gradually float across the screen. They shoot clouds of mist bullets as they wind their way through the air. 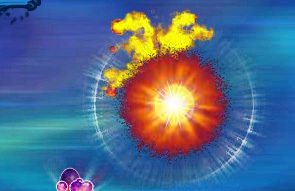 At the end of each level, the sky burns a fiery orange color, and out comes the nebula enemy. It can shoot crystal, aqua, and mist bullets at will. It is much stronger than any of the other enemies, and the strongest of them have special attacks in addition to firing regular bullets. The nebula enemy has the ability to cloak itself in a veil in invisibility. It is very difficult to land a hit while it’s in this state. Calling on its minions to do its bidding, the nebula enemy can call lesser enemies to the skies. 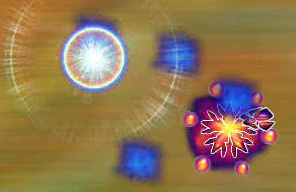 The nebula enemy can teleport around the screen for a dizzying attack. The nebula enemy’s shadow attack is by far the most devastating of its kind. It reduces your health down to the lowest possible, and one more hit is enough to destroy you. Avoid these dark little demons at all costs. If you destroy enemies consecutively, you have the chance to earn a bonus item. When you see a bonus item, tap on it to move the spirit over to the item and activate it. 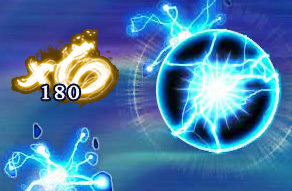 For a brief time, you gain a special power and become immune to damage. Your score values will be multiplied by two on top of your current weapon multiplier value. Burn your foes to a crisp as your spirit entity transforms into a fiery orb that takes out everything it touches with the meteor shield bonus. Use the plasma bolt bonus to instantly destroy all enemies on screen with powerful lightning bolts. Bend the world to your will with the warp shield as you reflect enemies and their bullets in the opposite direction to attack their own kind. 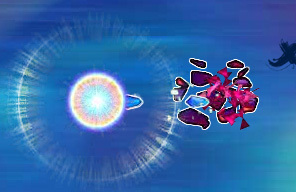 The nebula enemies with special powers at the end of levels are not so easily fooled; they are immune to this bonus. Use the absolute zero bonus to inflict frigid temperatures in the skies, freezing all enemies and bullets in place. Points are awarded when you defeat enemies while you are at full health. Each enemy type has it’s own base score that can be multiplied by your weapon or bonus item’s base multiplier value for a larger final score. 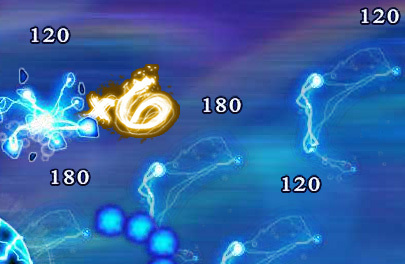 When a new multiplier value comes into effect, it is shown on screen. If you are not a full health, defeated enemies will award life instead of points. To resume earning points, kill enough enemies to recover all of your health first. There are additional settings in the drop down menu in the bottom left corner of the title screen. In addition to the default normal mode that the game starts with, you can change the difficulty mode to either easy mode or hard mode. This changes the toughness of the enemies you face as well as how many enemies are in each level. It also changes the rate at which you can earn bonuses. Bonus items spawn more easily in easy mode and less frequently in hard mode. You can change the default language setting from English to Spanish, French, German, Portuguese, Russian, Chinese, Japanese, Korean, Thai, or Arabic.